Behind our car system is a sophisticated control software. From the predictive driving style of the wonderland could also in this country one or the other motorists determined to look something else. The PC control software always has to act according to the “what happens if…” principle. In the beginning, despite the magnitude of necessary calculations, our tests showed quite good results - but only in slow motion. But in 2008, version 2.0 of the software was finally ready to take over. After switching to the second generation software, the number of forced stops could be reduced by about 60 percent - mission accomplished! Besides, it supports 256 commands for each vehicle (free programmable and each command can accept any number of parameters). Using the new software, it became possible to individually control 100 disco lights on a Love Parade truck in motion with a virtually endless program that is saved on the PC and sends just-in-time commands to the truck. True, that may not necessarily be required for daily operations. But it demonstrates the system's potential, made possible by a data transfer rate of almost 1 MB/sec. Since the available address space has been expanded from 256 to 65,535 vehicles, the only remaining limit is the size of the layout. 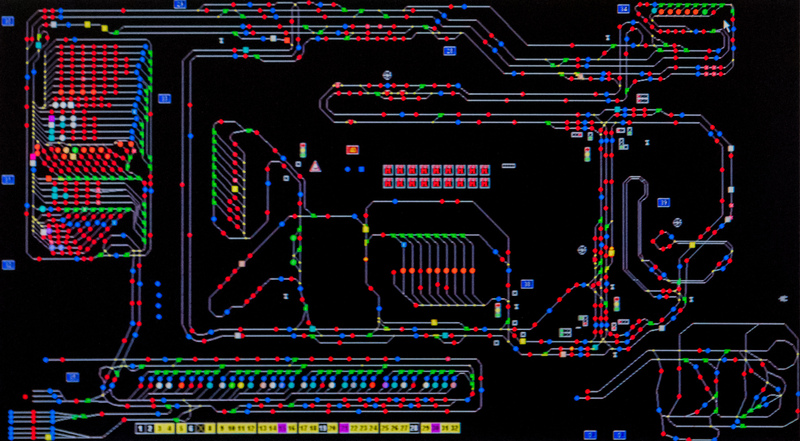 Equipping all vehicles with the new processor took more than 1,000 hours; upgrading the components within the layout proved to be even more time-consuming. Currently, a new function is in its early design stages. It includes a form of artificial intelligence, letting the vehicles, resp. the PC, learn from problematic situations in the past to avoid similar ones the next time. The source code of the current software consists of approx. 168,000 lines of which about 100,000 form the basic program, 42,000 for fire incidents, and 18,000 lines of software inside the vehicles itself.